I had dinner all planned. Yep, I am one of those types that plan dinner while eating breakfast. Can’t help it, that’s what goes on here early in the am. Tonight’s plan was a Mediterranean inspired swordfish on the BBQ with tons of fresh rosemary, lemon and olive oil. With the fabulous warm weather we have been enjoying, and thoughts of an endless summer swirling in my head. Well that’s not what happened. Mother Nature had a little hissy fit here in my backyard. Yep, rain, wind, the whole enclilada. I wasn’t going to brave the elements to get anywhere near that barbecue, nope not me. Being in possession of 3 beautiful swordfish steaks, I had to come up with a plan. 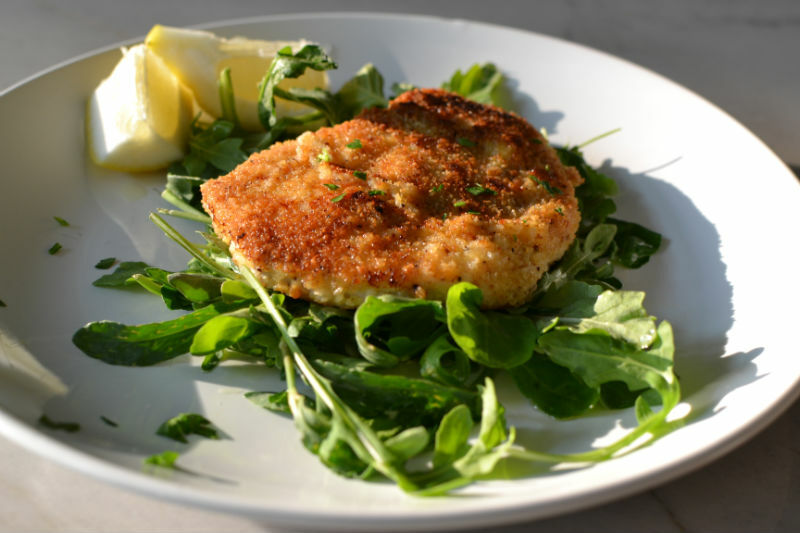 We had just enjoyed these crispy chicken cutlets a few days before, and I am never one to turn down anything savory and crispy. So we dunked those babies in beaten egg and rolled them in panko then fried them. Then served them up perched on a bed of lemony arugula and watercress. Don’t tell Mother Nauture, these beauties were so outrageously good, that I am not at all mad at her anymore! Cut each swordfish steak in half vertically then each in half horizontally to about 1/4" thickness. Place on platter and sprinkle with salt and pepper. Place panko, parmesan and salt and pepper in large shallow bowl. In another large shallow bowl add beaten egg. One at a time dip steaks into egg then dredge in panko mixture. Melt 1 Tbs butter and 1 Tbs oil in large heavy skillet over med-high heat. Add 2-4 steaks at a time, careful not to crowd them. Cook until browned and crisp on both sides, about 2-3 mins per side. Reserve on platter and tent with foil. Add remaining 1 Tbs butter and oil and continue with remaining steaks. While last few steaks are cooking, whisk lemon juice with olive oil in large serving bowl. Add arugula and watercress, and toss to coat. To serve place salad on plate and top with swordfish steaks.